Make useful items with these precut shapes! Precut blank leather shapes make dozens of useful items: Key chains, name tags, hair barrettes, camp souvenirs, and much more! Great for schools, camps and all recreational organizations. Decorate with markers, acrylic paint and rubber stamps with dye-based ink (sold separately). We used these for both necklace pendants and keychains. Precut makes it easy! These crosses were used for a Vacation Bible School project. We easily drilled holes in them and attached cording to wear them around the neck. 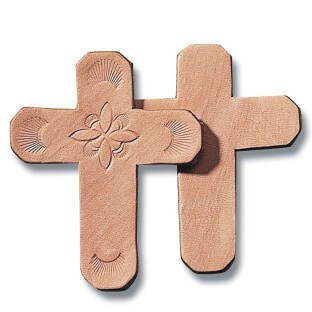 They ended up being a simple craft and size of the cross was perfect. Great light weight cross--they worked out wonderfully! This is good quality leather that can be stamped with leather stamping tools dyed or painted. If you don't have leather tools it can be decorated with colored pemanent markers. We make bookmarks of them each year and even the boys love this activity ... it isn't easy to please the boys in art.